Although his name suggests otherwise, Griz is a black bear. He was born in the wild in northwestern Montana, and orphaned when he was only a few months old. His mother was considered a “nuisance” bear and was shot, leaving Griz alone. He weighed around 10 pounds when he was found – just a tiny cub. 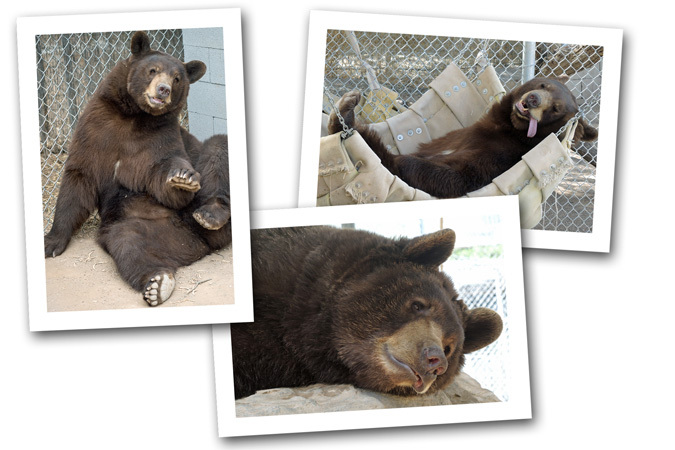 At the wildlife rehabilitation center where he was first taken, Griz was named for his fearless attitude and light-colored coat. He was a brave and confident little bear. It was at this rehabilitation facility that he met one of our other resident black bears, Tahoe. Tahoe was very shy, but Griz took her “under his wing” from the moment she arrived at the center. The wildlife rehabilitation center couldn’t care for the baby bears long term, and began to search for a sanctuary for the pair. Griz and Tahoe found their forever home at Southwest Wildlife and made the long journey from Montana to their new home in Arizona together. When their caregivers stopped in Lehi, Utah, and employees at the Albertson’s grocery store discovered there were bear cubs waiting in the parking lot for their breakfast, they donated fruit for their meal. Lots of people had to stop on their way into the grocery store to marvel at the little bears. These days, Griz remains a gregarious and happy bear. He lives with Tahoe and Igasho, another young, male black brown bear.